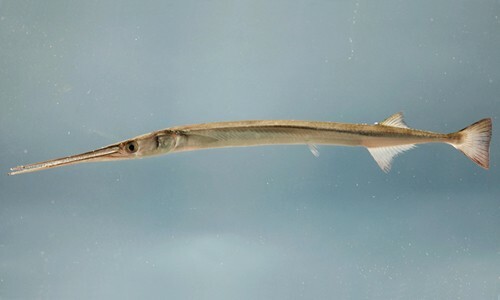 Adults most often found near the shoreline; juveniles common in the Bay's shallows. School near the water's surface. Visit the Bay from May to November. Adults are most common near the mouth of the Bay during spring and autumn, when the coastal population migrates. Juveniles move up the Bay as far north as the Patuxent River. The red drum is a large, reddish fish with at least one black spot at the base of the tail. It visits the lower Chesapeake Bay from spring through autumn. The red drum has a silvery body with a reddish or copper tinge and a silvery-gray to white belly. Its scales have a dark center, forming poorly defined lines on its body. It usually grows 20 to 30 inches in length, but can grow as long as 5 feet and weigh as much as 90 pounds. One or more large, black spots appear at the base of its tail. Its tail fin is squared. Red drum prey upon smaller fish such as anchovies and menhaden, as well as crabs and shrimp. Juveniles eat zooplankton and small invertebrates. The red drum makes a drumming sound. Spawns in late summer and autumn at night in coastal waters near the shore. Large females can produce two million eggs per season. 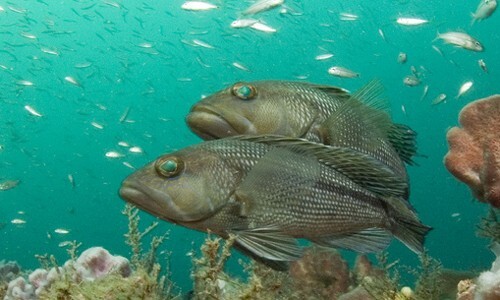 After spawning, adults spend more time in the ocean and less time in the Bay. 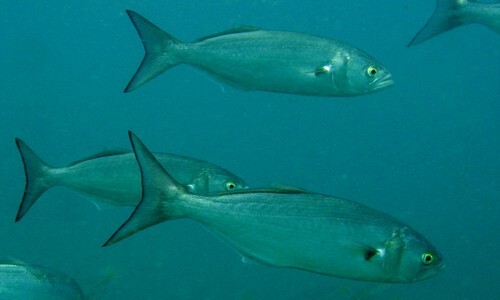 Young-of-the-year appear in the Bay in August to September and move into shallow, fresher waters. Males mature at 1 to 2 years old, while females mature at 3 to 4 years old. Red drum live for 35 years on average; the oldest recorded red drum was 62 years old. The red drum is also known as a redfish or channel bass. It is a popular sport fish. Red drum are a member of the drum family, which includes spot, weakfish, black drum, spotted seatrout and Atlantic croaker. All drums are able to make a loud drumming or croaking sound by vibrating their swim bladder using special muscles. Atlantic croakers are the loudest of the drums. Some scientists believe the purpose of the spot(s) near the tail is to mimic an eye. This fools predators into attacking the wrong end of the fish and gives the red drum a chance to escape. In 1984, a Virginia man caught the 59-inch, 94.2-pound world record red drum off the coast of North Carolina.